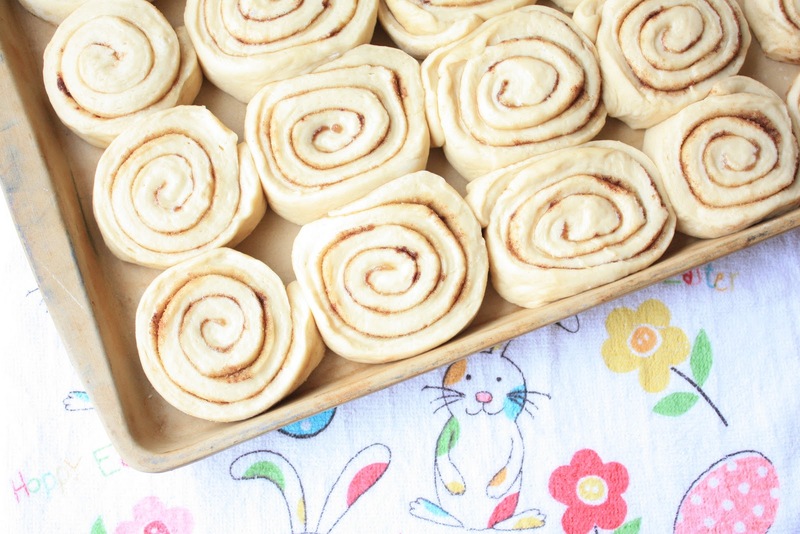 We love these cinnamon rolls. Not only are they light and delicious, but they whip up in no time at all, especially for a yeast roll. It's only about 1 1/4 hours from start to finish. 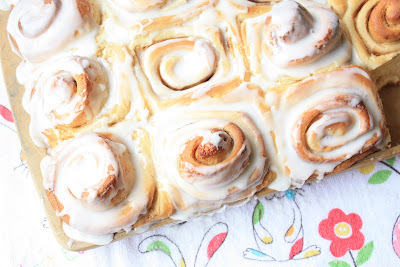 This cinnamon roll recipe has been around so long, and has been modified so much that I have made it my own. Besides using quick-rise yeast, I also hurried the rising time along by letting the rolls rise in a 150 degree oven for 15 minutes. I add almond extract to the frosting which gives them an extra dose of indulgence. These cinnamon rolls would be perfect for Easter morning. Actually, they would turn any ordinary morning into something special. 8. Put them on nonstick cooking-sprayed(or parchment lined) cookie sheets(I use my stoneware, no spraying or parchment needed) and allow them to rise until they are double in bulk(For a faster rise, place in oven set at 150 degrees for 15 minutes, then bake). OOOOOOh those look amazing. I want one right now! I've been looking for a good cinnamon roll recipe. Thanks for sharing! Oh these look fabulous! I have to make some pans in the next couple weeks but was going to use round disposable cake pans- I'm assuming they'd cook for the same amount of time or do you think I should decrease the cooking time?? My family got leftover bagels yesterday. Good thing they got "nourishment" from somewhere else. These look fabulous. I love a good cinnamon roll. 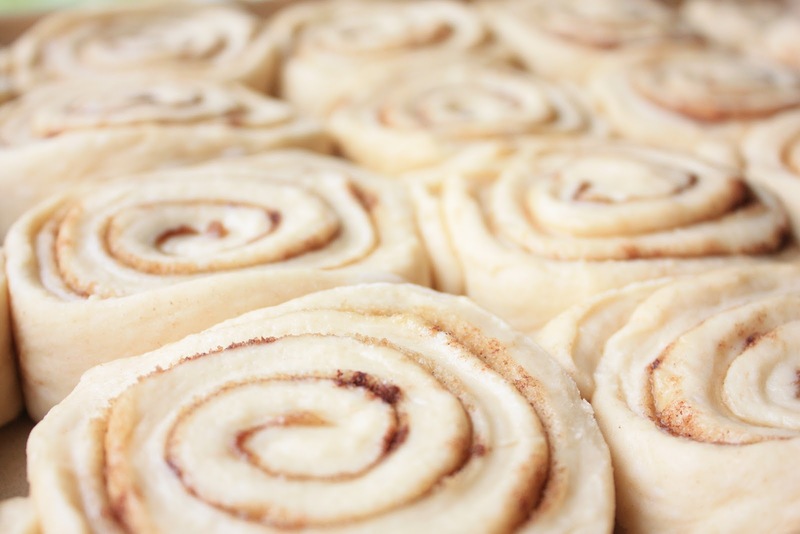 I can't imagine not wanting the frosting on cinnamon rolls. They look fantastic. I'm soooo close to licking my monitor screen...Sue these look like heaven!They look absolutely amazing and I'm sure really delicious! How delicious! I'm really going to have to make these. I too, would want to eat the whole lot! You know, I have never really ventured into the realm of cinnamon rolls. I have a fear of failure where yeast breads are involved. These are the best I've seen! Really? Unfrosted cinnamon rolls? Who would have thought! LOL!! These look fabulous, one of my favorite breakfast foods. Yum! We all had cinnamon rolls on the mind. It was a good thing I made mine last week as I was sick in bed for Conference. There was no one there to make the cinnamon rolls. These look so yummy, I could have one right now (bedtime) and I wouldn't even feel guilty! 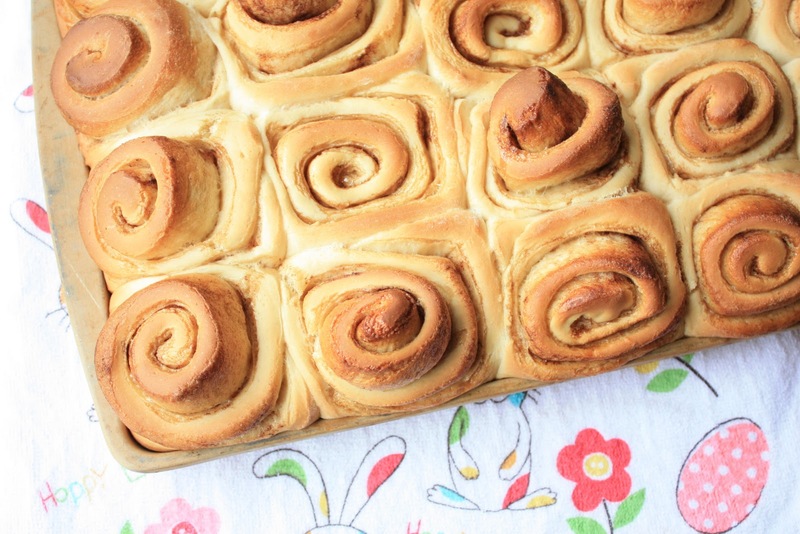 Very delightful cinnamon rolls. They are so perfectly made that I do enjoy looking at them even I don't get to taste them...they must be very yummy. Those cinnamon rolls look just amazing. Your husband must have self-discipline of steel if he's asking for them unfrosted! You're right, these are perfect for this time of the year when hot cross buns are abundant. Nice images! Beautiful cinnamon rolls! YOu are a great baker. Sue- You're making me hungry. How wonderful to have family over to share those delicious rolls! Oh my holy heck! I must have these right now! They look amazing!!! 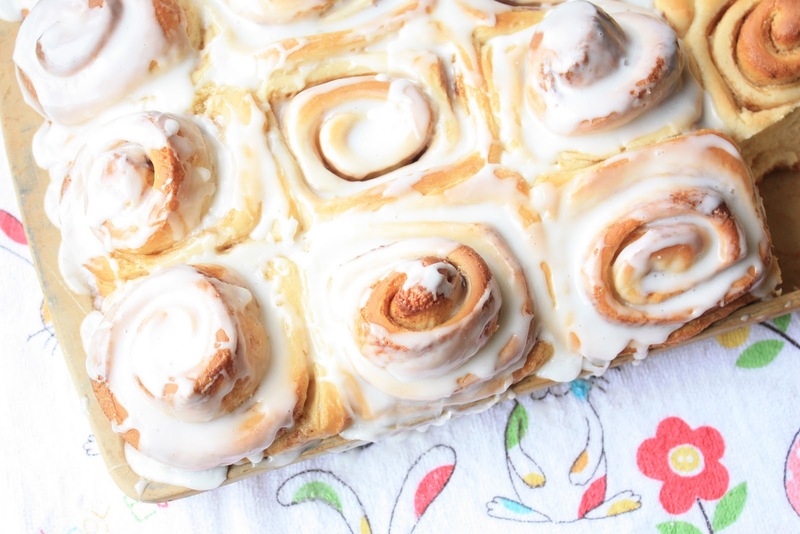 These cinnamon rolls look divine. 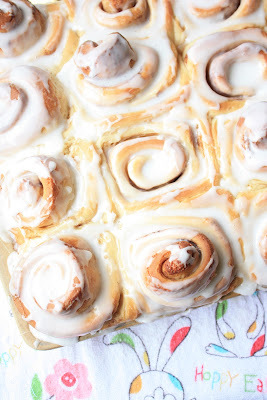 I've been on a hunt for a good cinnamon roll recipe and would love to try these. Mmm, what a wonderful way to spend conference morning, enjoying the talks and munching on some fantastic looking rolls. Yumm These look so warm and yummy..
Beautiful looking pan of rolls. I'd eat them for breakfast for a week straight! I am the same way with the cinnamon and sugar....who measures? Those rolls look wonderful. oh wow, i could eat one right now!!! My mouth is watering looking at these! Divine! Trying to kill me with these photos! They look delicious! Yum! I've been dying to make cinnamon rolls, just haven't found the time. Your recipe sounds wonderful. Wow a faster way to make my bf's favorite treat? Sign me up! Awesome! I LOVE your blog! There goes my cake for Easter! I will have cinnamon rolls! Have not had them in ages ... love them! SO MUCH!!! Now I can go and sleep. Cake plans for Easter settled.